June 7, 2014 was the day I learned, firsthand, how real the risk of heart disease in women really is. As I was volunteering with a group of friends from work for a Repair Affair event in our community I started having a deep burning in my chest. I passed it off as “overdoing it”. As the burn/pain got more intense many things went through my head but since I was only 34 years old with no history of any heart problems I was positive it would pass after some rest. After over an hour of trying to convince myself it was no big deal and my family insisting I take this increasing chest pain more seriously, my husband took me to the ER. I told them my symptoms and they immediately hooked me up for an EKG, within what seemed like a few minutes I had a large clot removed from my heart and a stent in place to help with the damaged caused by the clot. “I’m only 34!” I remember telling the doctors and everyone I could find. I couldn’t wrap my head around what had happened for weeks. Laying in the hospital bed I learned how serious those “risk factors” I had been disregarding played a much bigger role in my heart’s health than my age. I had heard about heart health for some time but never thought it would hit that close to home, especially at that age. “Your heart and arteries look great, except for the random blood clot” I remember the cardiologist saying. So the hunt for the cause of the blood clot began and ended quickly. Possibly even with their first question. “Do you smoke?” My response, after the moment of clarity, “not anymore”. I knew smoking was a risk and bad for me, but this…? There were other factors that Im sure played a part in forming that blood clot, but I knew in that moment that smoking would kill me if I continued. 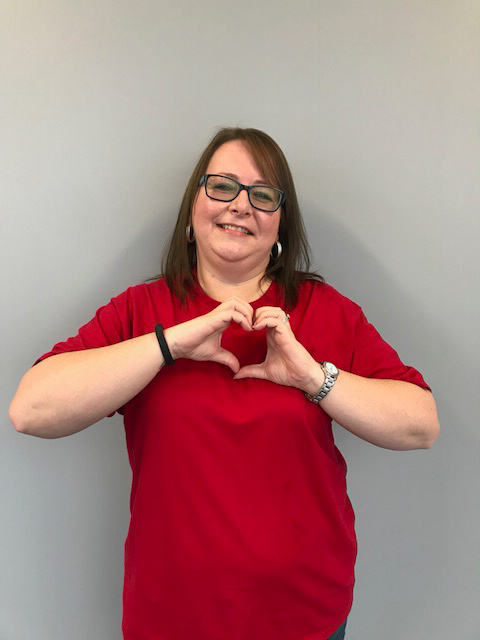 Quitting smoking was not easy for me, but with all of the heart health information I soaked up in the days following my heart attack I knew I had to make changes in my life. My first change was to quit smoking. I will forever take medication to thin my blood and protect my heart. I also continue to struggle with my eating and fitness habits but I am determined to make better life decisions than I was making in 2014. I share my story to raise awareness. I’m so lucky that my heart attack did not cause more damage or worse, because of my ignorance and denial that anyone at my age could have a heart attack. The more we can educate ourselves and our families about the risks and symptoms of heart disease the more we can protect ourselves. I wear red today because nearly 80 percent of cardiac events can be prevented and cardiovascular diseases continue to be a woman’s greatest health threat. Making healthier decisions is not always easy so we need to support each other. If you don’t make your health a priority, who will?